Did you study geometry, per chance? Love it. Very attractive TT, nice combination. They look very nice Tt. It makes me want to have a go. This reminds me of a glass paperweight - how pretty. ... would autumn be okay ? I don't know the names of all of my houseleeks, but I'll know if they are different from yours ..Lol. Super, so neat , how do you do it ? The houseleeks did it ... Lol. 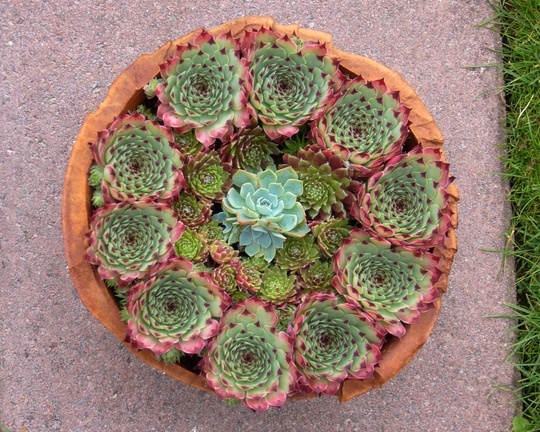 it is important to talk to your houseleeks in "Sempervivum" language .. then they grow in pretty patterns .. ;o) Lol. Not only a dog trainer, TT, but a houseleek trainer too :) Mine spread all over the gravel in a very disorderly fashion! Hi Gee and Amy... Thanks..
Nice design TT, makes a lovely show. Don't you love houseleeks! Great pic!! Lovely Terra. The outside ring is very pretty with the pink outer leaves and the dark tips......What variety please? Very nice TT. You are clever with your houseleeks. What a creative plantation Tt! Lovely potful Terra ... they're so striking. Visited Hyde Hall and found Sempervivium Calcareum there. I wondered about Conker, as there was gap in your postings. I am willing him to stay well to quell your anxieties. trying to get lots of tasks done before winter arrives ! What a delightful display......very artistic TT. do you have houseleeks in your garden ? Just found this now....love it!